Worship is "Theo-centric"-It starts with God; The Father seeks people to worship Him in the way He demands. Worship is subjective- in SPIRIT means that our spirit responds and communicates with the Spirit of God. Worship is objective- in TRUTH means worship must be based totally on scripture, the Word Of God. 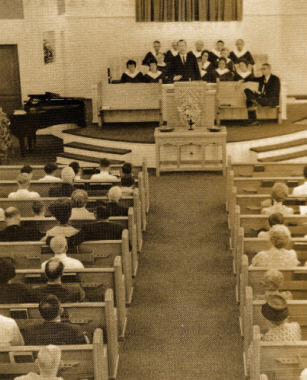 Balance in Worship-psalms, hymns, and spiritual songs. All three are related but have different functions. Varety in Worship-God loves variety! Let's give our very best to Him using many styles of music. Focus in Worship-Everything we do must be done in the name of Christ with an attitude of gratitude. At FBC, we offer many opportunities to serve God through music. We invite you to come and use your talents for the Lord. The Celebration Choir is the worship choir of FBC. 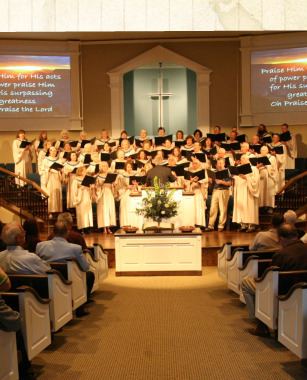 The choir leads worship every Sunday morning at 10:50 a.m. in the sanctuary. The choir presents special music on Sunday mornings and also presents special seasonal events and musicals. How do I become a member? No audition or music reading ability is required. Do you love to sing? Come, join us, and be a faithful member. Wednesday evenings: 6:30-7:30 p.m. Special rehearsals called for special events. The Adult Praise team helps lead in morning worship. The function of the praise team isto encourage congregational participation in worship and to introduce new worship songs. The FBC Orchestra is an instrumental group of Woodwind and Brass players as well as keyboard, guitars, bass guitar, and drums. The orchestra plays every Sunday morning on the worship songs and also presents special music from time to time. 8th grade thru adult (must have played an instrument for at least two years). How do I become a member? Approval of Director. The KidZone Praise miniters to our children through four avenues: music, drama, puppets, and art. Our KidZone praise groups learn to use the arts in varieties of ways to praise God and present programs at various times of the year. We have five separate age groups: Ages 3-4, Ages 5-6, Grades 1-2, Grades 3-4, and Grades 5-6. How do I become a member? Just come on Wednesday evenings and join us. Also special times for special events. First Baptist Church is very blessed to have gifted and talented musicians who are dedicated and willing to serve Christ and His church. We are thankful for their hours of preparation and service each week in preparation for worship services and special events. The Media Ministry of FBC is an integral part of our worship services and special worship events. Media ministries includs sound, lighting, powerpoint, and video. We are blessed to have the following members who devote their time to be trained and then perform their tasks with diligence and expertise.